Cookery School is tucked away on Little Portland Street in central London. It’s a food and cooking oasis near the the hustle and bustle of Oxford Circus and Regent Street. Rosalind Rathouse opened Cookery School 12 years ago after unsuccessfully hunting for a cookery school to teach basic cooking skills to a student she was tutoring. Cookery School has since flourished and grown, but has stayed focussed on a core set of values: sustainability, using high quality organic ingredients and a genuine desire to equip students with cooking skills to use in everyday life. Rosalind grew up in South Africa, but has a long history with London. I caught up with Rosalind to find out more about her story and how Cookery School came into existence. What excites you most about food and cooking? Having wonderful ingredients and when I see ingredients that just invite you to cook them. I love it when you’re at a market and you see things, and they just suggest meals to you. They tell you what you’ve got to do; you don’t need to make any decisions as they are already made for you. How did your love of food start? I came from a family that loved food. The raw ingredients in South Africa were beautiful and we always had good home cooking. We didn’t have a lot of access to very sophisticated things, but you could track them down and my mother used to. When I was a child we had something called the Rand Easter Show, which was an agricultural show where everyone bought horses and cows. There was also a home industry section and every year we used to enter. I entered against my mother and my aunt, and I also entered the children’s section. I was allowed to miss early morning school to take in my entries. I’d would sit in the car with a tray on my lap of scones and cake. A couple of days later you’d have to go back to see what you’d won. You’d get the usual rosettes and certificates, and it was all very exciting. You also got a little money prize; a few shillings in those days, not very much, but it was the excitement of winning and seeing who had won that was more important. My mother, aunt and I used to enter the fruit cake section using the same recipe. There was very friendly rivalry; so friendly I can’t even remember who used to win. How much did your mother and grandmother influence your cooking? Well my grandmother had cooked a lot and she taught my mother how to cook. My mother was a brilliant cook and her sister was also an excellent cook. Food was always just part of what we did. We used to make all our own bread. My mother had this wonderful Swedish mixer that kneaded bread. I saw one the other day on Amazon and thought I’d love to get one of those, just like my mother had. I also have 3 brothers; one of them did the Rand Show one year with me and he ended up liking cooking. The other two didn’t really cook. How old were you when you started cooking? I was about 6 or 7, so quite young. From very early on it had been a tradition in my mum’s family that on her mother’s birthday she would make her mother a meal. So when my mum’s birthday came around, I always used to cook the meal. 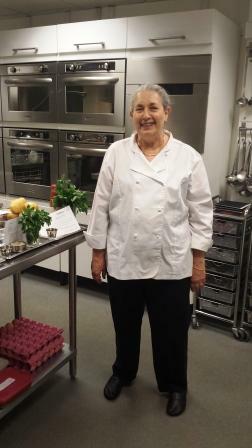 How did you move towards teaching cooking professionally? I didn’t love school; I was a bit naughty. My father always wanted me to be a doctor like he was, but I really wasn’t doctor material. On his death bed when he couldn’t speak, he was just lying and nodding. I had to tell the doctor what was wrong with him. When the doctor walked away, he said in a quiet raspy voice, “Darling, I always told you that you would have made a good doctor”. I didn’t realise he had always held out this hope, but there was no way. I was very lazy at school. I did absolutely nothing. I spent more time entertaining the class. I think I was very bored actually. Having said that, we were very well taught on some things, like Latin. I could still teach Latin easily as I can remember everything we learned off by heart. I can say things parrot fashion, as that’s how we learned. I wanted to do Domestic Science at school, but my father wouldn’t let me. I had to do all science subjects. When I went to university, I did an Arts degree so I picked up some of the things I’d missed in my school education. I never did History and those sorts of things at school, as I was going to be a doctor. But I realised I wouldn’t be when I didn’t get into Medicine. When I did my Arts degree, I found I was much better at that than I had been at the sciences. My husband was an architect. I met him while I was still at school and he was in his final year of Architecture. I did my degree and he was working. We got married in the middle of my degree when I was 20. We married very young in those days. I finished my degree and worked for 6 months. We then came to England for my husband to do a post-graduate diploma in Open Design at the Architectural Association (AA). I supported us financially then. We had a wonderful time being in London in the sixties. We had no money at all of course, but I could cook. I had more recipes for mince than anyone I ever knew. I could create kofta curries, sweet and sour meatballs, and hamburgers. We used to have these things called flash fries, which were 2 inches of meat beaten out till they were 4 or 5 inches. If we had one of those it was a treat! My husband was often working in Northern Ireland in the early years, doing a town expansion in Ballymena. Meat was so cheap that he’d come back with a whole fillet of steak, sometimes a rump, and the most gorgeous handmade sausages. We used to think we’d died and gone to heaven because we could never afford to eat anything like that in London. Things like salmon, that are so common now, were also totally out of the question. When I was a child you couldn’t afford to eat chicken; it wasn’t something you could cook in the sixties as a cheap meal. Even when I came to England, chicken was the biggest treat. I think you learned to use your chickens very well as there wasn’t a part you didn’t use. You’d use the giblets inside, and also the bones to make a stock or chopped liver to make liver pate. It’s still very much part of the Cookery School ethos. You don’t get your chicken with everything coming with it anymore, but we still use the whole chicken when we teach. We do chicken four ways: roasted, in soup, in a salad or pie, and paté. What do you think it would take to get more home cooks taking this approach of using the whole animal? I think people really need to learn how easy it is. This should be taught in school. I feel very strongly about this. It’s the sort of thing they should be teaching higher up at school, rather than for small children. When you’re leaving for university your food suddenly becomes economical. Anyway, I think we’re over ‘protein-ised’ and we eat far too much protein. We don’t need the protein that people have become accustomed to eating. In fact, it’s also part of the whole sustainability approach we have at Cookery School. We have 3 stars from the Sustainable Restaurant Association and were the runners up for the Most Sustainable Cookery School. The winners were Daylesford Cookery School, and the other runner up was River Cottage. They’re both in the country and can use their own chickens and grow their own veg. Given we’re in the middle of the city, we really thought it was okay being a runner up! Tell me a little more about your approach to sustainability at Cookery School. There are lots of things we’re probably even tougher on than others are doing around sustainability. I feel so guilty on days that we teach meat cooking; these are days that are totally devoted to meat and it means focusing on one ingredient, but it’s the only way we can do it. For anything that’s left over, like roast beef or lamb, we freeze it straight away and will use it in cottage pies or shepherd’s pies. We never like to waste a thing. What work did you do when first came to London? When I came to London I taught. I’d never taught in my life, but they were short of teachers. They took everyone at that time, as long as you had a degree. It was a baptism of fire, but I learned to teach. I taught on the Harrow Road, which was an area with a high immigrant population. People were being brought in to work on London Transport, so there were lots of West Indian people. I used to be so homesick for the sun and food we’d had back home, and they were too. I then left teaching and had children. We went back to South Africa as we’d promised our parents that we would. We went back for 3 years. I hated being back because apartheid was at its worst at that time in the late sixties and early seventies. The children went to nursery and I went back to teaching. But friends wanted to learn how to cook. So from one friend wanting to learn, I ended up opening what was a little cookery school. No one did that in those days, but I had to keep white and black people separate. Did this lead to you opening up a cookery school when you moved back to the UK? No, when I came back I taught. I did home tuition at first, then went into a school and did my teacher’s training part-time. In 1977 I moved to a small independent school and I used to do cooking with the children. I started a common room and the children used to cook for it. Because it was a small school we all tried to share our expertise on different days of the week. While I was there, one of my brothers was killed in an accident and it suddenly started to make me think about what I wanted to do. I fell into teaching by default, but it was not what I set out to do. I really wanted to cook, so I opened a pie factory. I made pies for the Orient Express and cakes for Waitrose. I had a partner and we were going for big contracts. I did that for about 2 years until 1986, but it was the wrong time as my children were adolescent and then my mum was very ill. At that point Sainsbury’s were talking to us, Waitrose were taking our cakes – and we walked away from it! I tried to find someone to take over, but couldn’t so I went back to teaching. What then led to you opening up Cookery School? Quite by accident I started tutoring. My husband got really ill, and I needed to stay home and look after him. My tutoring built up into a huge business. I was tutoring about 40 kids a week, including one boy taking a year out. He had some time to kill and didn’t know what he wanted to do. I suggested cooking and he said yes. I phoned a lot of cookery schools, but couldn’t find anything that was right. I said if only I could teach him I would, as I’d had a cookery school in South Africa. I left it at that. That night I told my family about it and they said this was the time for me to do it [open a cookery school]. That’s how we got the upstairs bit of what is Cookery School, and I took it from there. For the first 5 years I couldn’t teach as much at Cookery School as I was at home tutoring. Other teachers would teach at Cookery School during the day, and I would teach at night sometimes and on the weekend. I slowly starting dropping the number of children I was tutoring. I would keep them until they no longer needed me. A lot left naturally as they were doing A Levels or going to university. Each year numbers reduced dropped by half until I didn’t have any students left. What are your favourite classes to teach? I love doing the pasta class, and also jams and soufflés. The things that have wow value I also love, like puff pastry. It’s such an easy thing to make and once you can make puff pastry, you’ve got croissants. What would you suggest that would help people who are less confident about cooking feel more comfortable in the kitchen? Use a good and simple recipe for a start; if you get a recipe with a massive list of ingredients it’s a chore. Our recipes are really simple and straightforward. I’d also recommend recipes from Delia; she’s brilliant as her recipes work and you can learn to cook from them. Once you’ve learned how to cook from these recipes you can move on to other things. I also say learn from mistakes. Don’t be afraid of making mistakes as they are one of the best ways to learn. What 3 or 4 dishes are great for a beginner cook to have in their repertoire? This is something we think about for children, as we run a class for children at the moment. They do a half day of cooking with us and then go somewhere else in the afternoon, like La Fromagerie or Borough Market. It’s about increasing their food knowledge and making them feel excited about food. With the children we do a bolognese, a good tomato sauce and show them how to make bread. If you’ve got a basic bread recipe you can use it for pizza and rolls, so good cheap student food. We also show them how to make a tomato sauce because you can use it as a base for so many other things. Also with a bolognese you can use it a million ways. We do soups as well. It’s also important to learn to taste! On the Cook’s Certificate the students taste absolutely everything, over and over and over, so they’ve really got it. You mentioned before that you often freeze things at Cookery School. What would you suggest freezing that might surprise people? You can freeze leftover egg whites; they freeze perfectly. Any herbs we’ve got left we always freeze. We don’t use them for putting on fresh food, but for sauces they’re absolutely perfect. We keep everything in our freezers as we have to buy in bulk, even butter. By freezing we know we always have things in stock, like butter, chicken carcasses, chicken stock and leftover tomato sauce. We often have leftover tomato sauce from class so we put it straight into the freezer. If we’re doing a class for a group we can give them something like pizzette using the sauce. Where possible, we try as much as we can for people to take things home. It’s very cool to freeze now. When Cookery School started 12 years ago it wasn’t cool to freeze. Everything had to be fresh. In fact it’s very sustainable to freeze. If you’ve got a freezer that’s packed full you’re really utilising your electricity well, but you’re also buying things when they’re in glut. It’s cheap and freezing means you can use the food throughout the year. What other freezer food tips or recipes would you like to share? I still have raspberries and cherries in my freezer, so I can just take them out to make rødgrød. It’s a Danish dish and is absolutely wonderful. You take your berries or red fruits and put them in a saucepan from frozen with no water. Let them defrost over the heat, bringing the fruit up to the boil and making sure everything’s properly cooked. Don’t cook it for a long time as you want to keep the freshness. Then get rid of all the juices by pushing the fruit through a sieve, straining it all. Thicken it by adding cornflour and water. It looks thinnish while you’re doing it, but then as it sets you want it just on the verge of gloopiness. Put the mixture into separate ramekins or a big shallow dish. Sprinkle the top with sugar. The sugar melts so you get a liquid sugar topping. You then chill it. When you’re ready to eat it, serve the rødgrød with thick double cream poured over the top. I also keep all the ends of asparagus as I snap them off. I wash them and put them into a bag. I then keep adding to the bag; I must have about 4 or 5 bags at the moment. I boil all the bottoms to make a stock and liquidise it so it’s very thick. I push it through a strainer so what comes out is very green and smells like asparagus. I can make a soup from this, which I then freeze. What are the most exciting things coming up for Cookery School in the next year? There are lots of very exciting things happening. Firstly there’s our book, which we’re self publishing. It’s with the editor at the moment and is coming out soon. It’s called The Cookery School Manual. It’s written on a skill basis as this is the best way of teaching a technique. We’re not actually technique oriented at Cookery School, but it’s the best way to section things for a beginner. We’re currently having our courses accredited so people will have a formal accreditation at the end. We’re also doing things with young people – this is very much on our agenda. We’re bringing in groups of people who can’t cook to teach them how to. We’ve already started this with the school programmes, so it’s an extension of that. You can find out more about Cookery School on their website. You can also check out the Food At Heart Cookery Course listings for more upcoming cookery classes.